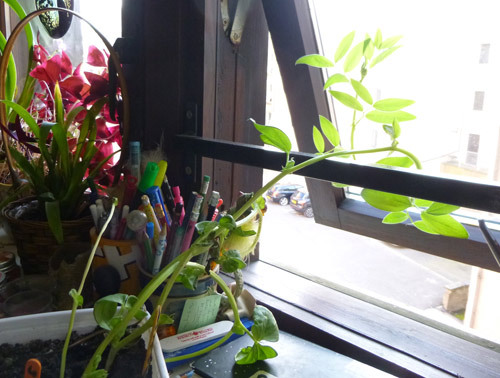 A bean plant displaying phototropism. Tropisms, also known as tropic responses, movements of plants in response to external directional stimuli. If a plant its laid on its side, the stem will soon start to bend upward again. This movement (geotropism) is a response to the force of gravity. The stem is said to be negatively geotropic. Roots are generally positive geotropic and grown downward. Phototropisms are bending movements in response to the direction of illumination. Stems are generally positively phototropic (bend toward the light). Most roots are negatively phototropic, although some appear unaffected by light. Some roots exhibit positive hydrotropism: they bend toward moisture. This response is more powerful than the response to gravity; roots can be deflected from their downward course if the plants are watered only on one side. Tropisms are controlled by differences in concentration of growth hormones. See also auxins.